High Resolution 5-Megapixel Ultra High Definition Video for Excellent Quality and Clarity; 5MP @20fps. 18 Powerful IR LEDs for 98ft Night Vision. 2.8mm Lens features a wide 104° viewing angle. Operating Conditions: -30° C ~ +60° C (-22° F ~ +140° F) / Less than 95% RH. Bullet Dimensions: 6.75 x 3.1 x 3.1 inches. 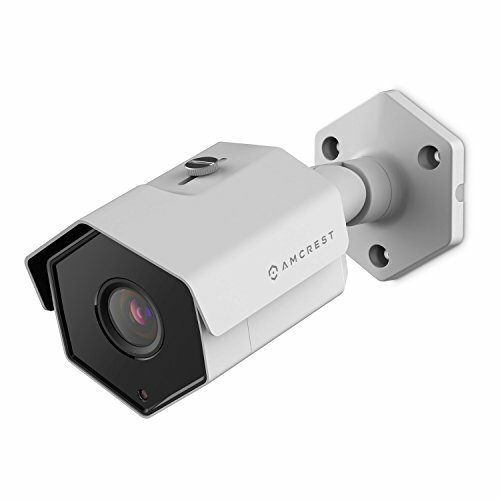 1 x 5-Megapixel IP POE Bullet Security Camera White (IP5M-1173EW). EXPERIENCE ULTRA HD – Observe high-quality footage with the latest progressive scanning image sensor, chipset and UltraHD 5MP resolution (2592×1944). A wide 104° viewing angle allows you to see more detail and cover more ground to keep more of what you love safe. Power Over Ethernet (POE) for easy installation (POE injector or switch required; not included, sold separately). SMARTER, SAFER SECURITY – Utilize intelligent alerts that send notifications to your computer or smartphone via the Amcrest View app. Record events as soon as they happen and store them on a Amcrest NVR, Synology, QNAP, NAS, FTP, Blue Iris or Amcrest Cloud. ALWAYS RESILIENT – Whether it’s rain or shine, day or night, this 5MP Camera features heavy-duty, weatherproof IP67 housing to withstand the toughest conditions. With IR night-vision up to 98 feet, you can keep the people and places you love safe 24/7.